As most giant turtles in the Galapagos Islands know, Celebrity Xpedition, Celebrity's mega-yacht used to explore the remote unspoiled islands, hasn't been around for a couple of weeks. They don't get news so they don't know where it's been. It has been in Panama for a seven-day makeover. The complete story appeared in the September 21 issue of Cruise News Daily. If you were a cruise line with a huge new ship, a new blimp and a larger-than-life sports legend who is on the payroll with the title of Chief Fun Officer, what would you do? That's right. 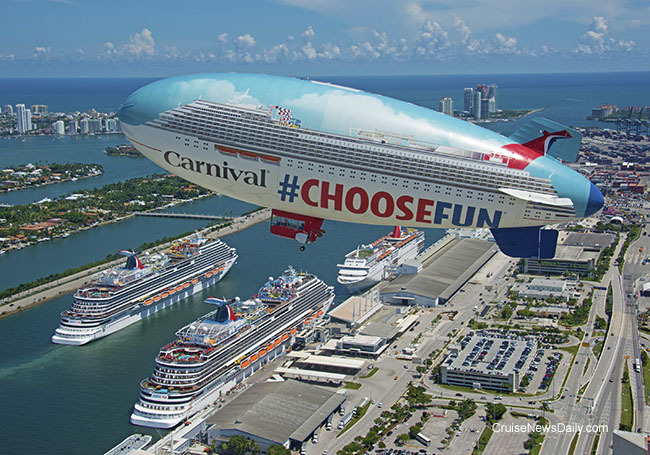 You'd bring them all together for an afternoon of fun, and that's what Carnival Cruise Line did in Miami yesterday. The occasion was Carnival Horizon's inaugural special two-night cruise from Miami. After a summer series of cruises from New York, the new ship has arrived in Miami, its new year round home port. It's been a year since a couple of hurricanes devastated parts of the Caribbean, and this afternoon, the Florida Caribbean Cruise Association this afternoon hosted a conference call to talk about the region's recovery in the time since. Taking questions were Adam Goldstein from Royal Caribbean (parent of Royal Caribbean International) and Arnold Donald of Carnival Corp, but they were actually there in their capacities at the current heads of CLIA and the FCCA. Oceania Cruises' Nautica was docked at Greenock (Scotland) yesterday (Wednesday) when winds in excess of 90mph broke the mooring lines and pushed the ship away from the dock. Details appeared in the September 20 issue of Cruise News Daily. After a successful 2018 summer season (that's not quite over yet), Seabourn confirmed they will return to Alaska next year in response to high customer demand. Seabourn Sojourn will return to Alaska for a season that will be just 10 sailings running just from June to October. It's been a year since Hurricane Maria swept over the Caribbean island of Dominica destroying many of the structures and much of the infrastructures. The island's thriving cruise business was also devastated with cruise ship calls for the 2017/2018 season dropping from 219 scheduled to just 33 actual calls. Yesterday, we received an update from the island showing us most the damage is in the past, and the island has recovered almost completely. It is looking forward to a rebounded 2018/2019 winter season. Have You Booked Your Summer Vacation Yet - for 2020? If you like to plan even farther, Norwegian can help there too, if you want to go to Hawaii. They opened sale on Pride of America all the way through the spring of 2022. It's less than three months before Celebrity's “transformational” Edge enters service, and the line is continuing to reveal aspects of the ship. At the end of last week, it was The Grand Plaza, the “heart and soul” of the ship, designed by Patrick Jouin and Sanjit Manku. The complete story appears in the September 17 edition of Cruise News Daily. If anyone is mailing you something from Australia, check the stamp. They may be mailing you a tiny picture of P&O's Pacific Explorer. 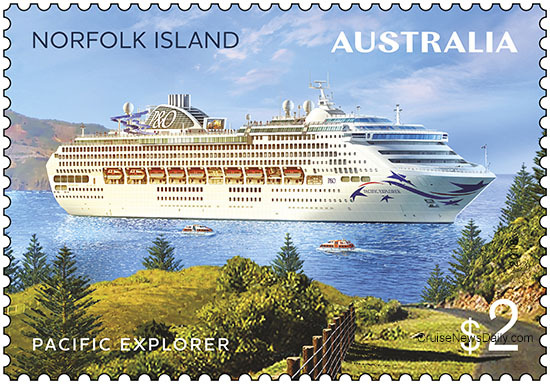 The Australian postage stamp is actually celebrating Norfolk Island which is a popular cruise destination, but it prominently features the P&O Australia ship, which is a regular visitor there. Details appear in the September 17 issue of Cruise News Daily.